Whether you're lacing up for the big race or not, celebrate the best running city in America. Rest and Recovery Panel at Peloton: Recovery is just as, if not more, important than hard training days leading up to the marathon. If your body is feeling particularly battered, and you want the tools to keep your performance up, attend this panel to learn stretches and best practices for recovery as part of Peloton’s marathon programming. Free, 6 p.m.-9 p.m., Peloton Boston showroom at the Prudential Center, 800 Boylston St., Boston, facebook.com. Beer-A-Ton Before the Marathon: Head over to Hops N Scotch in Brookline for a night of food, beer, and raffles to support Boston Marathon runner Edward Ryan-Guillot on his road to completing all six of the world’s major marathons. Free, 6 p.m.- 9 p.m., Hops N Scotch, 1306 Beacon St., Brookline, Eventbrite. Last Run Before Boston: Meet up with Marathon Sports for a group run from Boston to Brookline and back. Whether you start at the Boston store for the full 6-mile excursion or hop on at their Brookline location for a 3-mile run, you’re invited to join the group back in Boston for food, drinks, and raffle prizes. Free, 6 p.m., Marathon Sports, 671 Boylston St., Boston, Eventbrite. The Train in Wool Truck: Join The Woolmark Company at their pop-up Train in Wool Truck along its 5-day journey leading up to the big race. Track the truck’s daily spot to check out free physical therapy sessions, nutrition workshops, training runs, and giveaways as you gear up for Marathon Monday. Free, Wednesday 7:30 a.m.- 7 p.m., Thursday 7:30 a.m.- 7 p.m., Friday 10 a.m.- 6 p.m., Saturday 10 a.m.- 4 p.m., Sunday 8 a.m.- 4 p.m., see the truck’s daily location at woolmark.com. Brews at the Linden Lounge: 2018 Boston Marathon Winner Des Linden’s side hustle, Linden and True Coffee, is making a special pop-up appearance at Tracksmith’s Trackhouse on Newbury Street where you can sample coffee and Tracksmith’s newest beer collaboration with Mystic brewery. FYI Des will not be there, but her delicious coffee will be. Free, 6 p.m., the Trackhouse, 285 Newbury St., Boston, tracksmithrunning.com. If you’ve always dreamed of running a marathon but aren’t sure you’re ready to commit to a 26.2-mile trek, then this quintuple halved race might just be for you. At 0.826 miles, this mini-marathon is not only way less daunting, but it supports a great cause, too. $30, 6 p.m., Boston Common, 139 Tremont St., Boston, 826boston.org. Pre-Marathon Pasta Dinner and Social: Dorchester Running Club invites Marathon runners, along with their friends and family, to dine, drink, and reminisce on the highs and lows of training for this year’s race. Kids eat free, so make sure to bring the whole family along to this Marathon send-off. $26, 7 p.m., Florian Hall, 55 Hallet St., Boston, facebook.com. Boston Marathon Expo: Check out the Boston Marathon Expo where you can sample healthy snacks, try on marathon-specific shoes and swag, and even hear from notable race legends during the seminar series. With more than 200 exhibitors you have all weekend to explore. Free, Friday 11 a.m.-6 p.m., Saturday 9 a.m.-6 p.m., Sunday 9 a.m.-6 p.m., John B. Hynes Veteran Memorial Convention Center, 900 Boylston St., Boston, baa.org. Fan Fest: New this year, runners and fans will be able to head to Copley Square for weekend-long festivities including live music, seminars, and appearances from returning champions. Free, Friday 12 p.m.-8:30 p.m., Saturday 9 a.m.-8 p.m., Sunday 11 a.m.-6 p.m., Copley Square, Boston, baa.org. Inside the Marathon with Scott Fauble: Enjoy a burrito while listening to Scott Fauble, marathon runner and Hoka One athlete, as he gives you an inside look into what training for the NYC Marathon was like. Free, 5:30 p.m., the Trackhouse, 285 Newbury St., Boston, tracksmithrunning.com. Marathon Shakeout: Who says training for a marathon can’t be a party? Lace up your sneakers and hit the pavement with Boston Midnight Runners for a 7km pre-Marathon shakeout, broken up with three breaks for quick bodyweight workouts, and accompanied by a killer playlist. Top off the evening with post-run drinks and fun at the Warehouse Bar & Grille. Be sure to register ahead of time, as space is limited. Free, 7 p.m., Warehouse Bar & Grille, 40 Broad St., Boston, facebook.com. Marathon Trivia: See how much you know about the history of the marathon during this special-themed trivia night in the Eliot Lounge at the Trackhouse. Bonus: their special Mystic collaboration beer will be available for sipping. Free, 7 p.m., the Trackhouse, 285 Newbury St., Boston, tracksmithrunning.com. Runner’s World Pop-Up: Shop exclusive swag, become an early tester for Salomon shoes, and hear from legends in the running community like Kathrine Switzer and Meb Keflezighi, and so much more at the Runner’s World pop-up on Newbury Street. Some events require registration, so be sure to check the below information. Free, April 12-April 16, times vary, 179 Newbury St., Boston, runnersworld.com. Fresh Legs Boston: Stop by this Newbury Street pop-up runner’s lounge for Custom Performance NYC’s trademarked “Fresh Legs” treatment. Get your legs prepped for race day with hands-on stretches and compression boots. Prices vary, April 12-April 14, times vary, 270 Newbury St., Boston, Eventbrite. 261 Fearless Boston Run Club: Hit the pavement with this women’s running group, founded by female groundbreaker Kathrine Switzer, the first woman to officially run the Boston Marathon in 1967. Whether you’re an avid runner or you’re just starting out, you can join 261 this weekend in honor of Switzer’s Marathon legacy. Free, 9 a.m., Healthworks Back Bay, 441 Stuart St., Boston, Eventbrite. 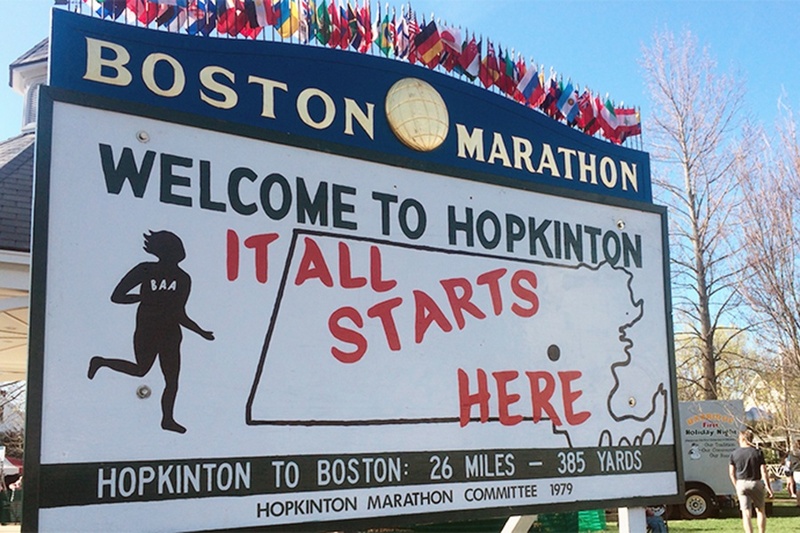 Boston Marathon Sign Making: On Saturday and Sunday drop into the Peloton showroom in the Prudential Center to make cool signs to motivate runners along the course or at the finish line. Free, 10 a.m.-9 p.m., Peloton Boston showroom at the Prudential Center, 800 Boylston St., Boston. Boston Marathon Meetup with The Run Experience: Spend your weekend warming up for the Marathon with The Run Experience co-founder, Nate Helming. Loosen your hips and engage your muscles with Nate’s pre-race dynamic warm-up, followed by a one to two mile run to get your body in fighting shape for Monday’s race. Free, 10 a.m.-11:30 a.m., Boston Common, meets at the corner of Arlington St. and Boylston St., Boston, Eventbrite. Shakeout Run Along the River: Get your blood flowing and your muscles loose for Monday with a group shakeout run along the Charles River. Free, 9:30 a.m., the Trackhouse, 285 Newbury St., Boston, tracksmithrunning.com. Samuel Adams Marathon Tasting: Raise a glass to the 2019 Boston Marathon with a flight of Boston-inspired brews, including 26.2, the official beer of Monday’s race. $10, 11 a.m.- 4:30 p.m., Samuel Adams, 30 Germania St., Boston, Eventbrite. Strength in Running- A Pro Runner Panel Discussion: Whether you’re registered for Monday’s Marathon, or just like to hit the treadmill at your gym, every runner could benefit from the expert advice at this all-star panel. With panelists like Olympian Dathan Ritzenhein, 2018 Boston Marathon runner-up Sarah Sellers, and Marathon Grand Marshal Meb Keflezighi, you won’t want to miss these pre-race tips. Prices vary, 11 a.m.-12:30 p.m., Sheraton Boston Hotel, Republic Ballroom, 39 Dalton St., Boston, Eventbrite. The Women Behind the Mic: If you love listening to podcasts, now’s your chance to come check one out live. Hear from runners and podcasters Ali Feller, Carrie Tollefson, Lindsey Hein, and Tina Muir, and stick around for swag and photos after the show. Free, 5 p.m.- 6 p.m., Sheraton Boston Hotel, Republic Ballroom, 39 Dalton St., Boston, Eventbrite. Beat the T: Ever sit on the Green Line when it’s moving painstakingly slow and wonder if it would just be faster to run? Well, wonder no more with this fun run hosted by Marathon Sports and Brooks Running. See if you can outrun the train that pro marathoners will be riding. Special prizes will be awarded to everyone who accomplishes the feat. Free, 1 p.m.-2:30 p.m., Marathon Sports, 1638 Beacon St., Brookline, brooksrunning.com. B.A.A. 5K: Although this race, open to the public, is currently sold out get ready to cheer on the marathoners and get in the Boston Marathon spirit by watching an estimated 10,000 participants head out from the Boston Common along Boylston Street in the eleventh annual B.A.A. 5k. Free, 8 a.m., Boston Common, Charles Street, Boston, baa.org. B.A.A. Invitational Mile: Some of the top mile runners in the world, along with scholastic boys and girls from around Boston, will join near the finish line for a invitational mile. Free, 10:30 a.m., Copley Square, Boston, baa.org. B.A.A. Relay Challenge: With over 20 middle school teams from around Greater Boston competing in this relay challenge there will be plenty of action to watch. The relay challenge is the final step in a month-long program taught by volunteer coaches. Free, 1 p.m., Copley Square, Boston, baa.org. Massages at Seaport Hotel: Swing by the Seaport Hotel on Saturday, Sunday, or Monday for the ultimate tune-up with the Boston Bodyworker. During Saturday and Sunday you’ll be able to take advantage of zero gravity reclining chairs, a lounge stocked with all the recovery tools you would ever need, and even 30-minute massages. All proceeds for body work services will go to the Martin Richard Foundation and the Massage Therapy Foundation. Prices vary, April 13-April 15, times vary, Seaport Hotel, 1 Seaport Lane, Boston, bostonbodyworker.com. 7th Annual #BostonRun: Marathon weekend undoubtedly brings the city together in a unique camaraderie, especially after the devastating events at The Boston Marathon in 2013. And since then, Zoom Multisport has been bringing together proud Bostonians for their annual #BostonRun, where anyone is welcome to join a run spelling out the word “Boston” on a path through the Back Bay, in a tribute to that tragedy and a celebration of our city. Free, 6:45 a.m., meets at the corner of Charlesgate Rd. and Newbury St., Boston, facebook.com. 7th Annual Pre-Marathon Bike Ride: Calling all cyclists! If you’d prefer to take part in the Marathon festivities on bike rather than on foot, join R.C.B for their annual pre-marathon bike ride where you can pedal along the Boston Marathon route out to Hopkinton and back for an impressive 50-mile ride. Free, 8:30 p.m., meets at the corner of Commonwealth Ave. and Arlington St., Boston, facebook.com. One Boston Day: After the bombings of 2013 Bostonians came together to show support and strength in a time of great adversity for many. In such spirit, a day for giving back was born. If you have the time today, check out the different events going on around the city where you can give back and make a difference in the community at onebostonday.org. Boston Marathon Pre-Race Dinner: All Marathon runners and friends and family are invited to City Hall Plaza for a pre-race dinner featuring pasta, salad, bread pudding, and more. Get your carbo-loading on in great company. Free for runners, $30 for friends and family, 4 p.m.-8 p.m., City Hall Plaza, 1 City Hall Square, Boston, baa.org. Yoga for Runners: Yoga is a great supplemental exercise for any type of training, running is no exception. Join yoga instructor Billy Gamble, at South Boston Yoga, for a Boston Marathon focused workshop the afternoon before the big race. The flow will incorporate light standing work and a long cool down that combines restorative poses and mobility work so you’re loose and ready for the big day. $30, 1 p.m.-2:30 p.m., South Boston Yoga, 36 W Broadway, Boston, southbostonyoga.net. It’s race day! Check back here for the top athletes to watch, where to eat, and the weather. Peloton Recovery Zone: Cross the finish line and head straight for Peloton in the Prudential Center, which is just a half mile away, for some much needed TLC. You’ll be able to take advantage of post-workout food, massages, and group stretching. Free, all day, Peloton Boston showroom at the Prudential Center, 800 Boylston St., Boston. Race Party at the Trackhouse: If you’re not running, watch the race with a group of people at the Trackhouse in the Eliot Lounge on television and then as the runners make the final stretch home head out to Hereford Street to cheer them on. Free, the Trackhouse, 285 Newbury St., Boston, tracksmithrunning.com.